Beautiful You: Monthly Favourites | May 2014! Monthly Favourites | May 2014! I really didn't know what to write about today and I know it isn't technically the end of the month but I am going to share my monthly favourites with you! 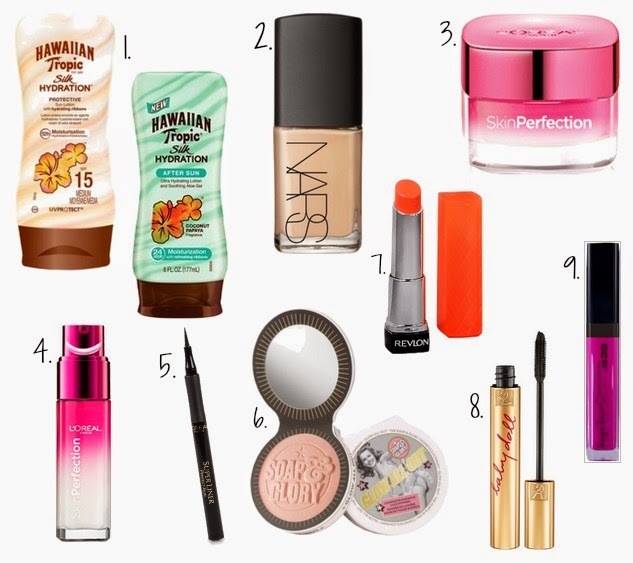 Some of these are new products that I have recently tried and loved and I just couldn't resist it! These are going to be completely random there is no structure to this at all but I hope you like it none the less. 1. Hawaiian Tropics Silk Hydration Sun Lotion & After Sun: as the weather has been getting nicer recently I have been wearing sun screen and the one I have been loving is Hawaiian Tropics Silk Hydration range. It smells amazing and makes your skin so smooth I had never used the sun lotion before but I had used the after sun and the smell always reminds me of my holiday last year as its what we took. It really does sooth the skin after you have been in the sun all day and makes your tan last so much longer which really is a bonus! 2. Nars Sheer Glow Foundation: if you follow me on twitter then you will know that I recently made the decision to buy the Nars Sheer Glow Foundation and I am so glad that I did! This foundation is amazing, simple application, brilliant colour range and I cannot rave about the wear time enough. It leaves your skin looking flawless and with a powder setting it around you t-zone it really does give your skin that summer glow. I will be posting a full review of this foundation on Wednesday if you want to have a read so stay tuned! 3. L'Oreal Skin Perfection Moisturiser: I am not a fan of moisturiser in the morning as I feel it causes my make-up to come off quicker but that might just be me, however recently I have been using and loving this L'Oreal Skin Perfection one and its brilliant. It is very light and therefore sinks into the skin very quickly and doesn't affect my make-up wear time. 4. L'Oreal Skin Perfection Serum: from the same range there is also a serum and this is what I use in the evening, this is so moisturising and smells so good. I cannot wait to have a shower in the evening just so I can put this on, it leaves my face so smooth and firm it is brilliant. 5. L'Oreal Super Liner: I only bought this liner a couple of days ago but I had to include it because I am obsessed already. I literally love how thin it is which also makes the application so much easier and I really wish I had discovered this sooner. I am thinking of doing an eyeliner review post so let me know if you would like to see that in the comments. 6. Soap & Glory- Glow All Out: I had bought an orange toned highlight but I could only use that with orange blushers so I found this one for my pink toned blushers. I don't like highlight to be very obvious as in my opinion it looks better subtle and this is perfect, it is very easy to build up though if you wanted to have a strong highlight. 7. Revlon Lip Butter- Juicy Papaya: I always rave about these lip products but they are so amazing, I have about 8 and I wear every single one. This one in particular is Juicy Papaya and as you know how much I love orange this is amazing for me. They are so hydrating and the colour pay off is brilliant, I literally cannot express my love for these lip products enough! 8. YSL Baby Doll Mascara: I not one for buying expensive mascara because my eyelashes are insane anyway. I always get picked on for having long and curly eyelashes naturally so I don't feel the need to spend a lot of money on a mascara. But this one had £5 off when I bought it and I have been using it more so recently and I am loving it again it really does make my eyelashes so much longer! 9. Tanya Burr Lipgloss: I cannot post my favourites without mentioning Tanya's lipglosses as they are so amazing. I recently completed my collection of them all and I am so happy. The one I have been using and loving this month is Heart Skipped a Beat as it is an orange and works perfectly with the lip butter I mentioned above! 10. These aren't on the picture but they are a couple of food/drink items that I have been obsessed with this month. Firstly is Snapple drinks, I cannot get enough of these, the flavour range is amazing and I am in love with the bottles! I also recently discovered that they sold them in Superdrug which made me so so happy! The other item I have been loving this month is strawberry laces, I literally eat them all the time and it is really bad but they taste amazing and you can get 3 for £1 in Co-Op! Those are all the products that I have been loving this month, for once they have changed slightly and they aren't all the same! If there is anything that you have been loving this month and you think I should check out then leave a comment below. If you follow me on twitter then you will know but this Friday is my 100th blog post and I have had something that I have wanted to announce for a while so there will be some big news come on Friday so stay tuned. I will see you on Wednesday with my foundation review! I really want to try the L'Oreal liner. It looks really easy to use. I would love to see an eyeliner review post.